This modest, 14-story building has the only mostly-glass facade on Fifth Avenue north of 59th Street, but its modernity is not very disruptive as its top floors are significantly setback and the glass has a very dark brown tint that does not distract too much from its swank, pre-war neighbor at 1040 Fifth Avenue. The design by Horace Ginsbern created very narrow balconies that use the same glass and the apartments have sliding glass doors that open onto them. The overall effect is appropriately discrete. In the late 1990s, the building attractively reclad its first floor in polished stone. Erected in 1965, the building was converted to a cooperative in 1980 and contains only 22 apartments. 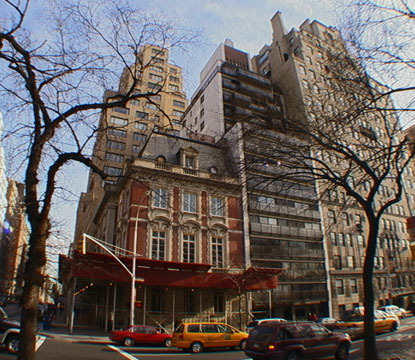 Its neighbor to the north is the large, handsome, Georgian-style mansion designed by Carrère & Hastings for William Starr Miller in 1914 and subsequently used by Mrs. Cornelius Vanderbilt III and the Yivo Institute for Jewish Research, and converted to the Neue Gallerie, the Serge Sabarsky Museum of German Expressionist Art, in 2001. It replaced two 1906 Beaux-Arts townhouses designed by Welch, Smith & Provot. It has a nice lobby and a doorman and a prime location along Fifth Avenue's "Museum Mile" with excellent cross-town bus service and it is one-block away from a limited Fifth Avenue bus stop and the Metropolitan Museum of Art. It has no garage.